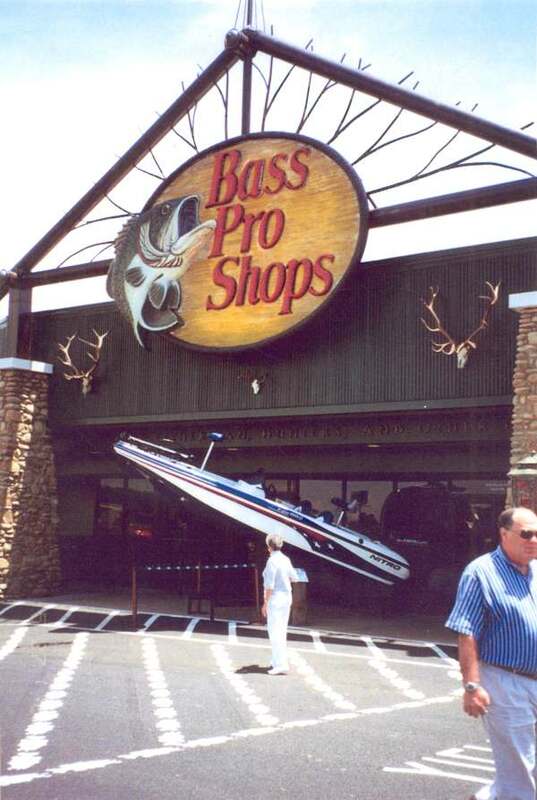 Bass Pro Shops Grand Opening for their newest store "The Sportsman's Warehouse" located in Memphis, Tennessee was held on May 23, 2002. 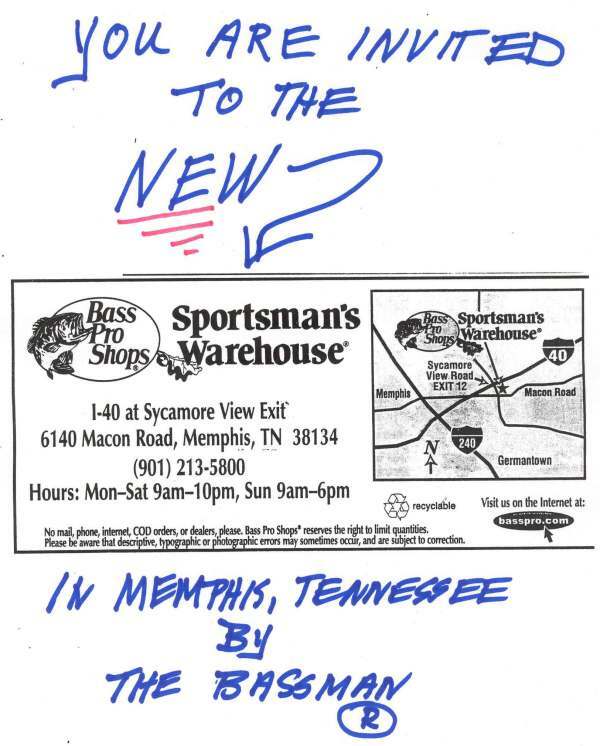 The new Sportsman's Warehouse is an 82,000 square foot store that features a boat showroom and fishing, hunting, camping, clothing and footwear departments. 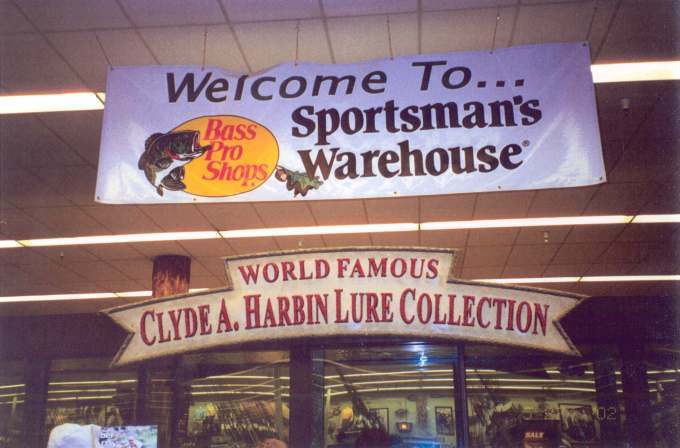 Entrance to the "Sportsman's Warehouse"
Bass Pro Shops purchased Mr. Clyde A. Harbin Sr. lure collection back in 1995. 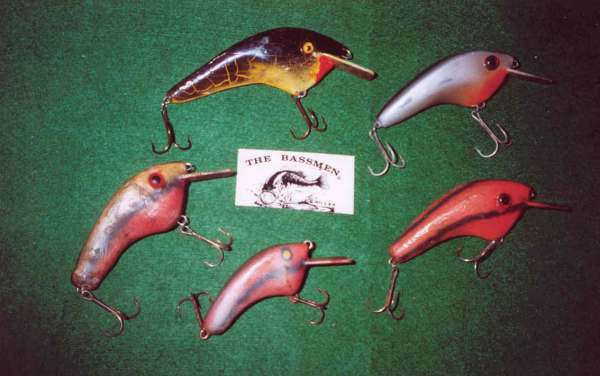 At one time the Bassman had over ten thousand lures in his collection. 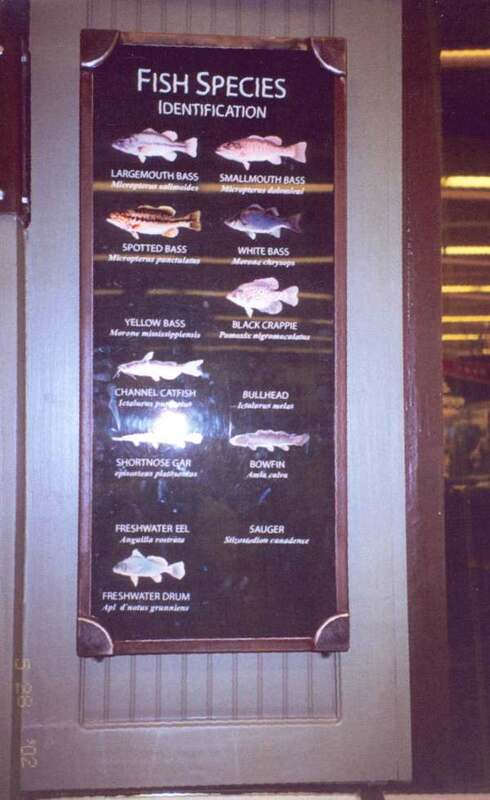 In honor of Mr. Harbin, Bass Pro Shops presents this special lure exhibit at the new Sportsman's Warehouse Store. Keith Towles and Jim Osborne display a copy of Old Fishing Lures & Tackle 6th Edition by Carl F. Luckey with Clyde Harbin Sr., "The Bassman". 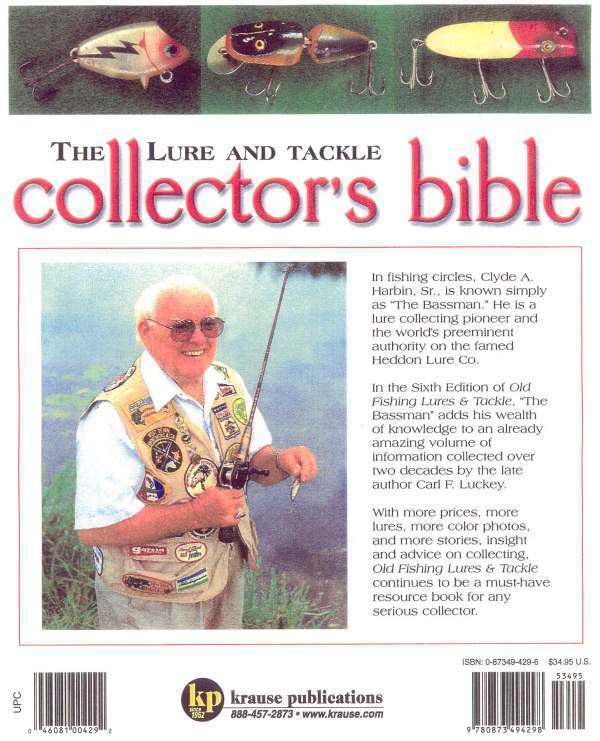 Mr. Harbin was heavily involved with this famous lure book since the 1st edition back in 1979. 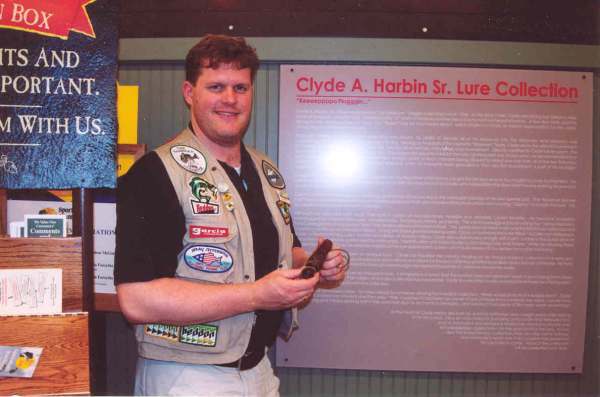 Mr. Clyde A. Harbin (The Bassman®) visited the new Bass Pro Shops Sportsman's Warehouse Store for the first time on May 30, 2002. 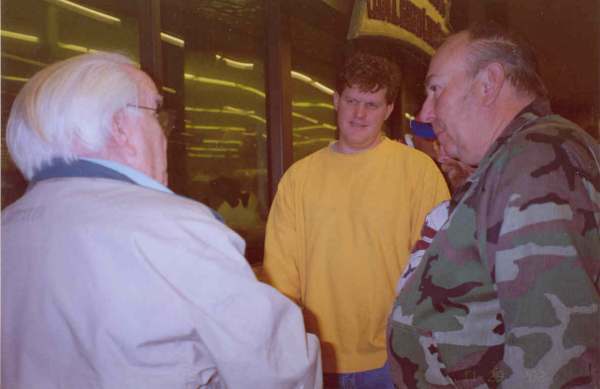 He was welcomed by Bass Pro Shops store manager Jim Osborne and assistant manager Keith Towles. 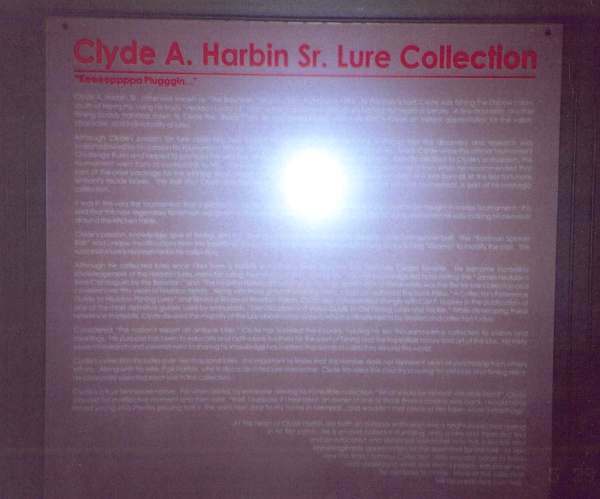 Clyde A. Harbin Sr. (The Bassman™) is standing alongside the first display case of the old lure exhibit. In the background is the huge fish aquarium which homes many large mouth bass. 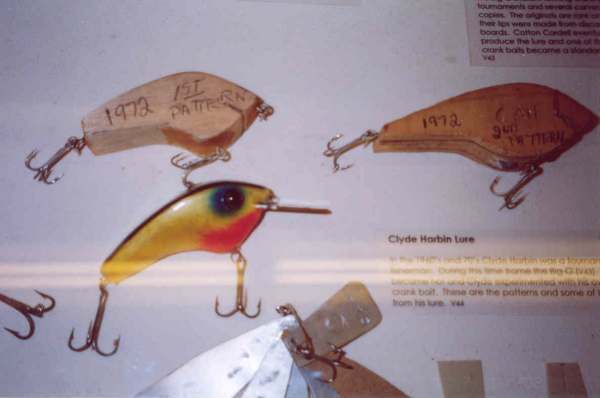 The lures in the below photographs are from The Clyde A. Harbin Sr. 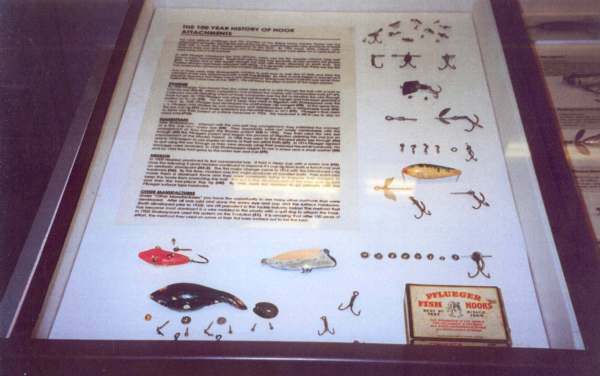 Lure Collection that are on display at the Sportsman's Warehouse Store in Memphis. 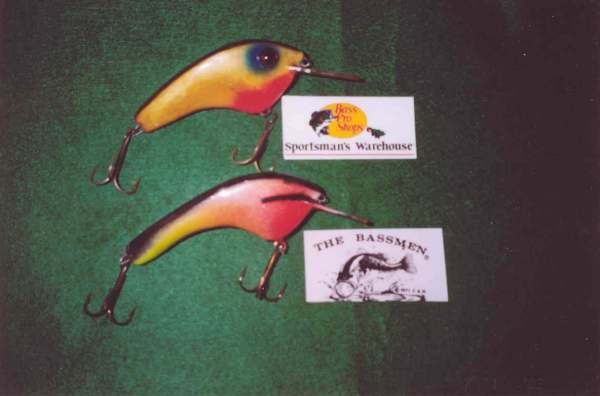 The 4th & 5th photo's are spinner baits of the Bassman's own design which he also marketed. 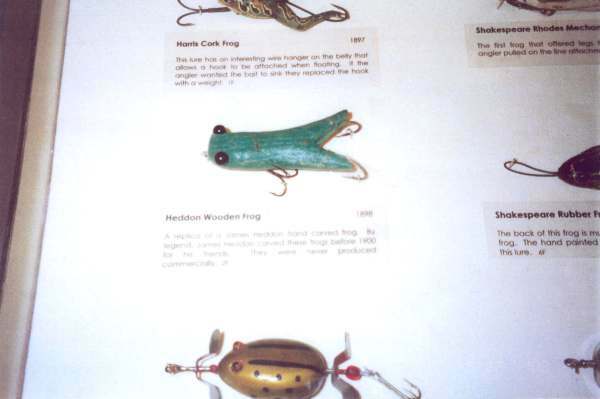 The 20th photo is a replica of a 1898 hand carved James Heddon wood frog. 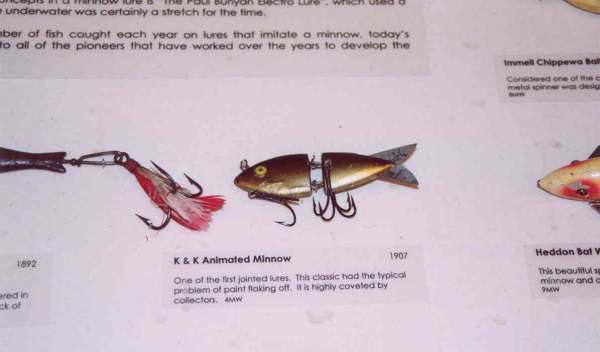 Mr. Harbin owned two of these rare frogs at one time. 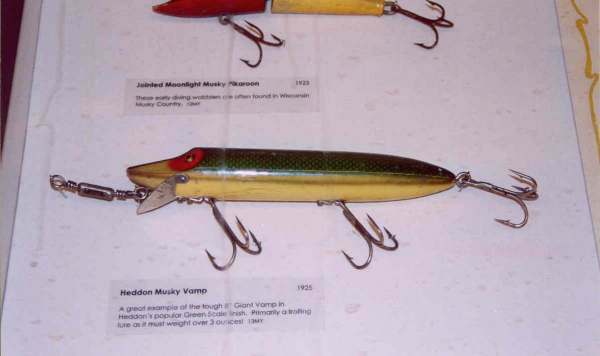 One of the frogs he swapped to his close friend Clarence Zahn and the other frog was sold to Bass Pro Shops with their purchase of the Clyde A. Harbin Lure Collection. Mr. Tony Isbell, Visual Manager of Bass Pro Shops "Sportsman Warehouse"
Mr. Tony Isbell is removing the screws to release the metal bands which hold the heavy duty thick glass from the display of crank baits ...ie... Fred Young original "Big 0" and other crank baits. 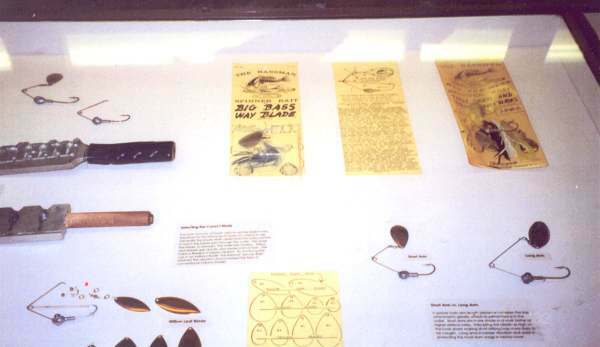 Also in this display are three Balsa Wood Patterns of the Clyde A. Harbin hand crafted "Double 00" models by year so marked. 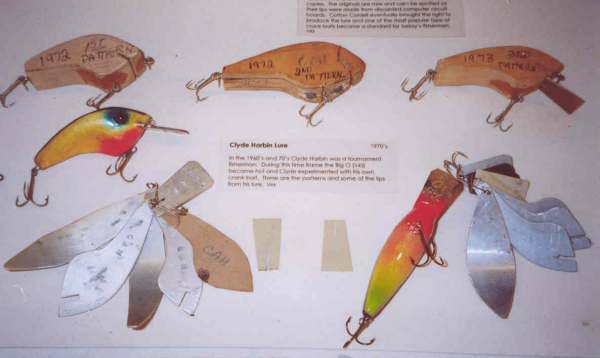 After Mr. Harbin visited the lure display in May of 2002 he requested that a "Double 00" be added form the World Famous Lure Collection that Mr. Johnny Morris had acquired from Mr. Harbin in the Spring of 1995. 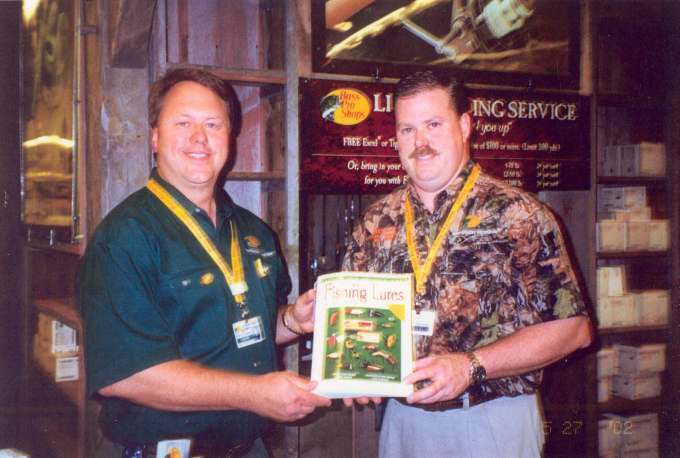 Mr. Rick Collins, Bass Pro Shops Wild Life Operations Manager, Springfield, Mo. 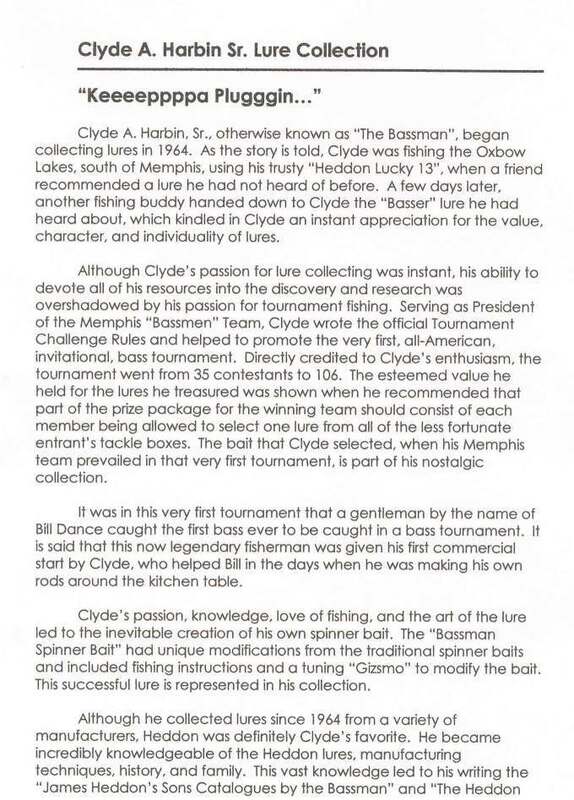 immediately responded and sent this Clyde Harbin crank bait for the addition to the crank bait display. 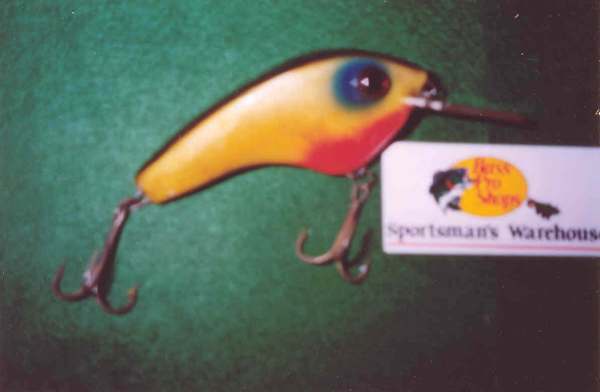 Top Bait - The "Double 00" from Bass Pro Shops 1995 Mr. Harbin lure collection. 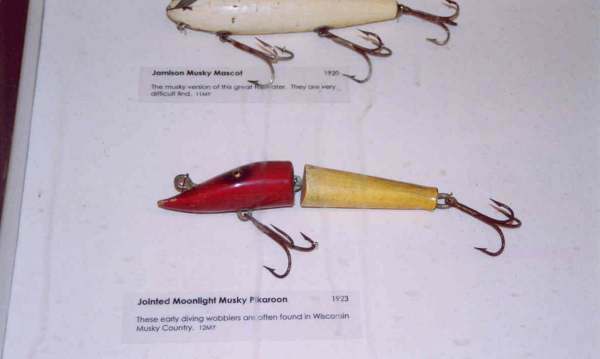 Bottom Bait - Un-fished "Double 00" which was returned to Mr. Harbin by Robert Edward Ferguson. 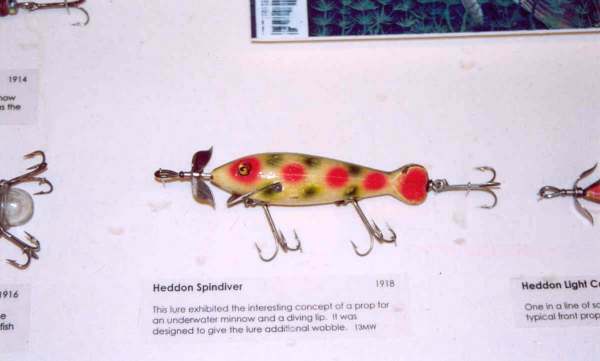 Mr. Ferguson thru the years provided the artwork for all the Heddon Hardware, Handmade Heddon Frogs and other lure artwork for Mr. Harbin's books since 1977. Mr. Ferguson is Mr. Harbin's good bass fishing friend of over 42 years (in the front of the boat). 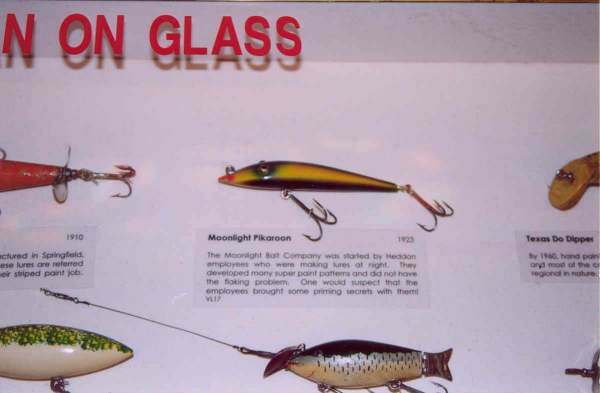 This returned "no eye model" lure was needed for insertion in this crank bait display. 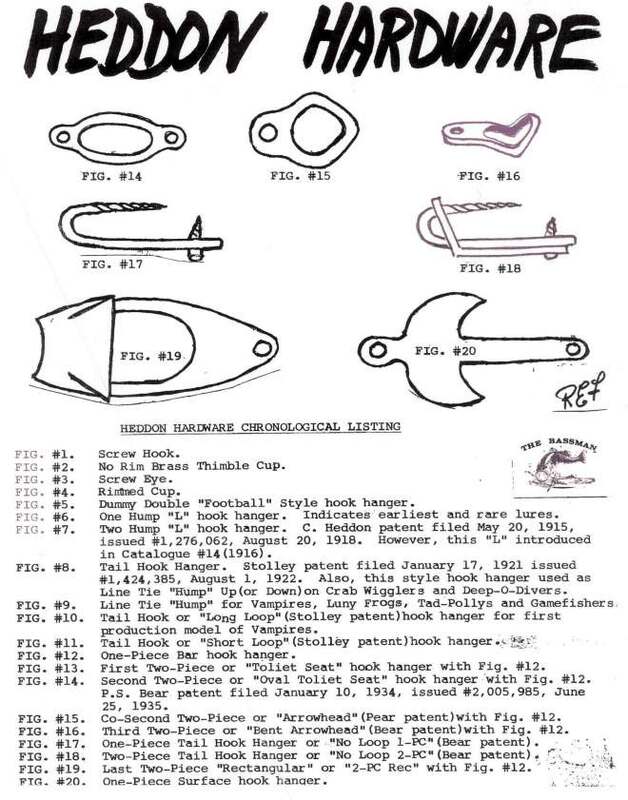 The under lip is marked "CAH 00". 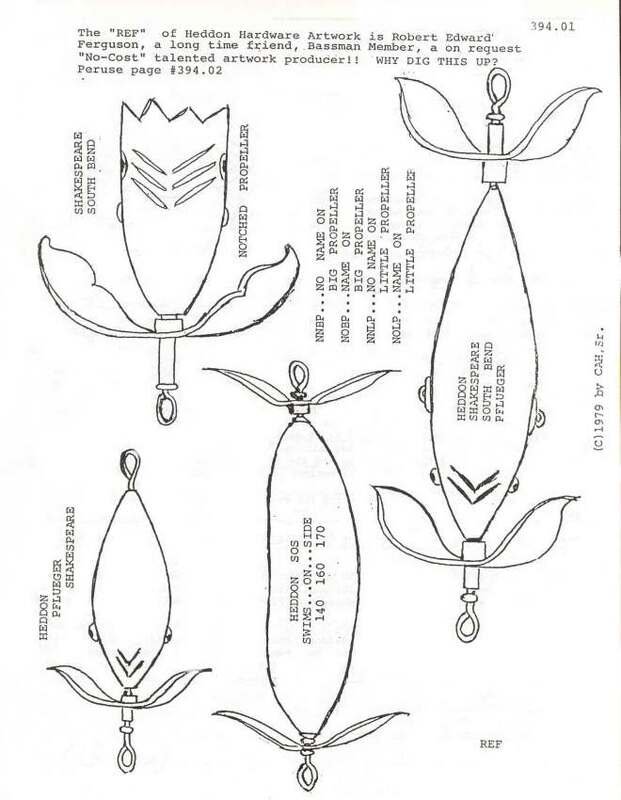 Mr. Tony Isbell installed each lure into position. 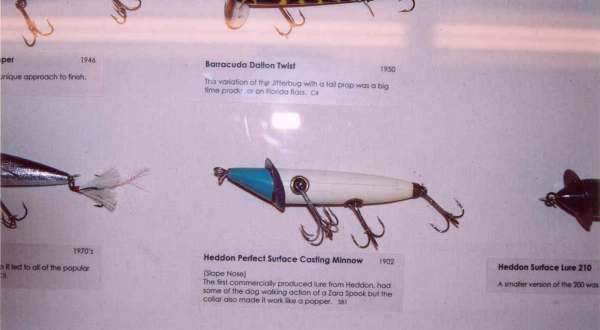 The Bass Pro Shops lure is below the Balsa Wood Model. 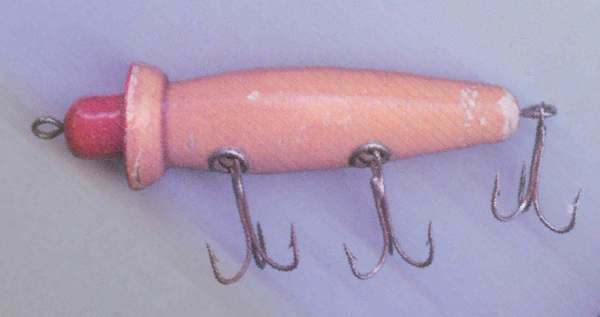 The Ed Ferguson "Double 00" lure is in position so the under lip engraving "CAH 00" could be read. 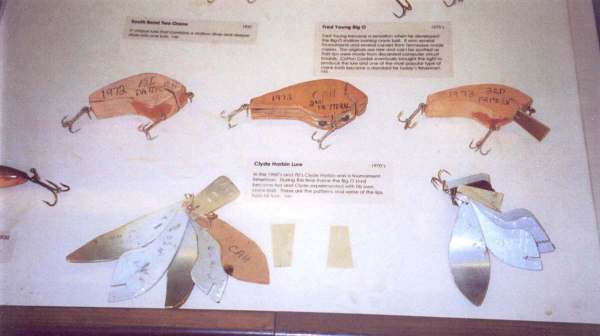 The above are some of the remaining Clyde A. Harbin "Double 00" crank baits. Today they are in Mr. Harbin Son's tackle box. 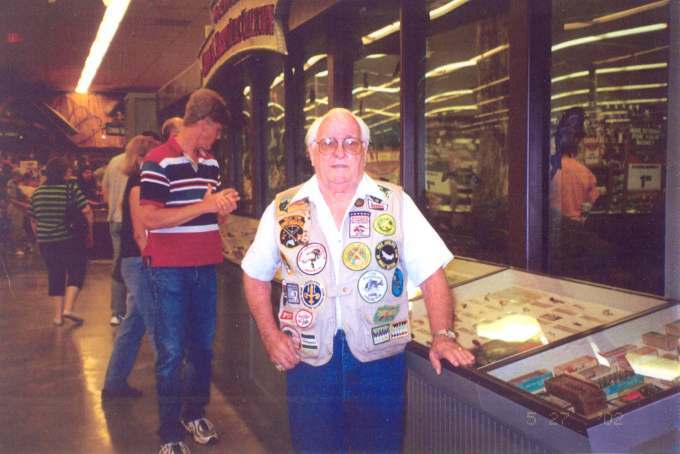 Tim Watts, Grandson of Mr. & Mrs. Clyde A. Harbin, Sr. visited Bass Pro Shops "Sportsman Warehouse" July 22, 2002. 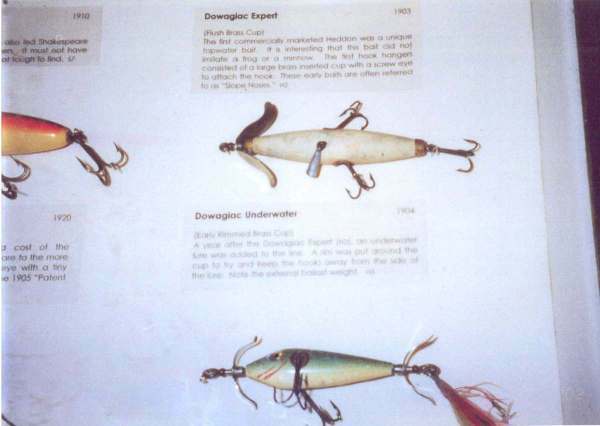 Tim Watts made the above eight photographs of lures which he recalls hearing about as a youngster and from the many swap meets he attended with his grandfather while he was growing up. 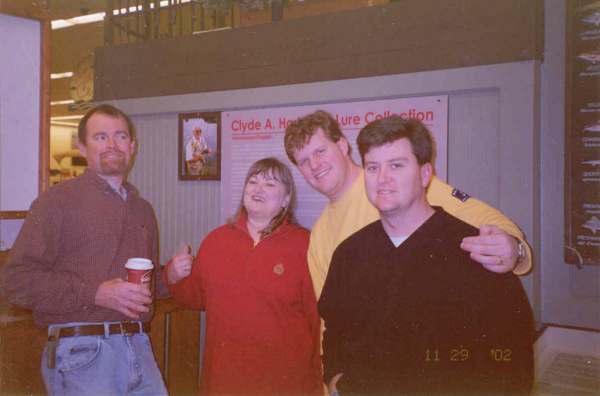 The following three photographs were taken on 11/29/02 of some of the Bassman's family members while visiting the Old Lure Display at Bass Pro Shops "Sportsman Warehouse". (left to right) Dewayne Ponds, Dr. Emily Watts, Tim Watts and Lonnie Smith pose in front of the Clyde A. Harbin Lure Collection "Essay" board. Clyde A. Harbin Sr. and Lonnie Smith. 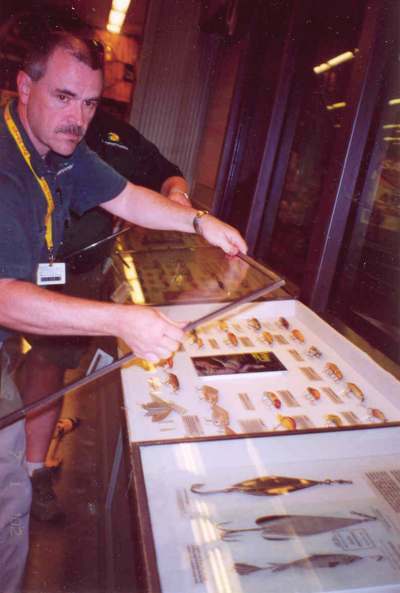 In the background enjoying the exhibit Dewayne Ponds and Tim Watts are inspecting the lure display. 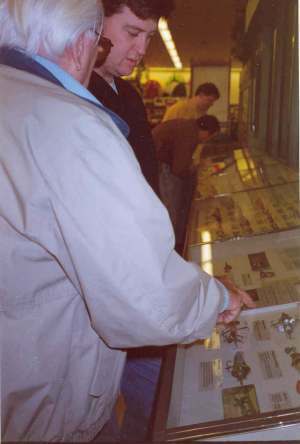 (left to right) Clyde A. Harbin, Sr., Tim Watts and a "Sportsman Warehouse" lure collector gathering information of Tim's latest e-bay purchase. 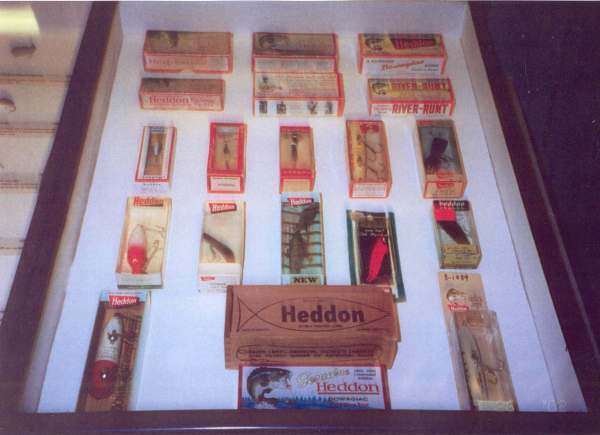 Tim had just won an e-bay auction of a rare Heddon "Woodpecker" during his annual Thanksgiving visit at Mr. & Mrs. Harbin's home in Memphis, Tennessee. Mr. Harbin assisted his grandson in this purchase. Dewayne Ponds and Lonnie Smith are Son-In-Laws of Clyde A Harbin II. Both gentelmen reside in Chattanooga, Tennessee. Tim Watts of Arlington Heights, Illinois is the son of Dr. Emily Watts of Bloomington, Illinois. 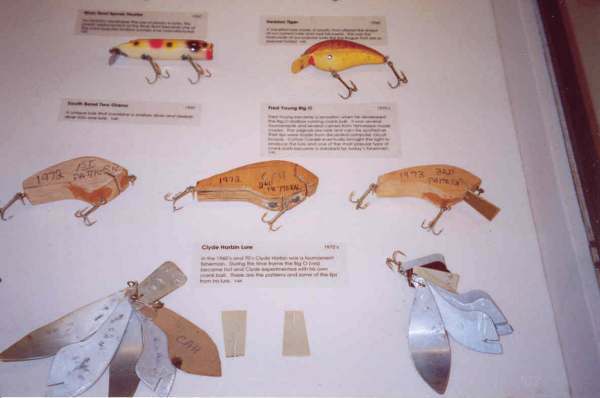 Tim Watts is a lifetime member of the NFLCC and an extremely knowledgeable old lure collector. 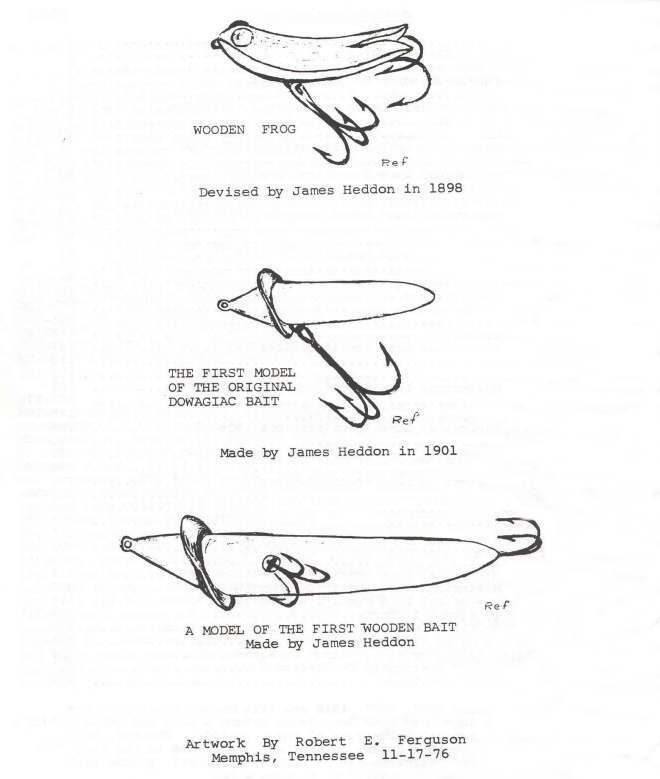 Tim Watts lure of his Rare First Version Heddon Woodpecker. 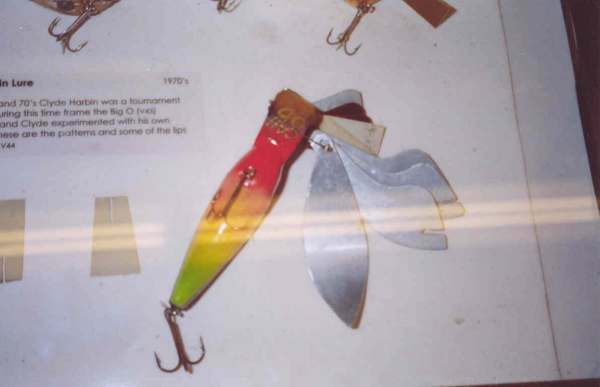 Lure scanned by CAH on 12/05/02 at his home in Memphis. This photograph was taken 07/02/03 of Mr. Clyde A. Harbin Sr. with Mr. Rickey Fuller and son Todd Fuller. 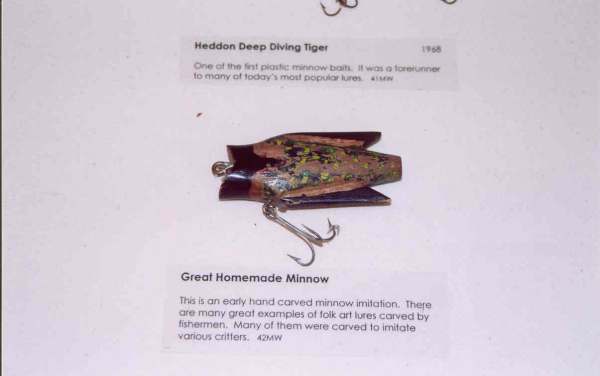 Mr. Fuller told Mr. Harbin of his grandfathers tackle box of lures which he wanted to learn more about and find collector values for these lures. 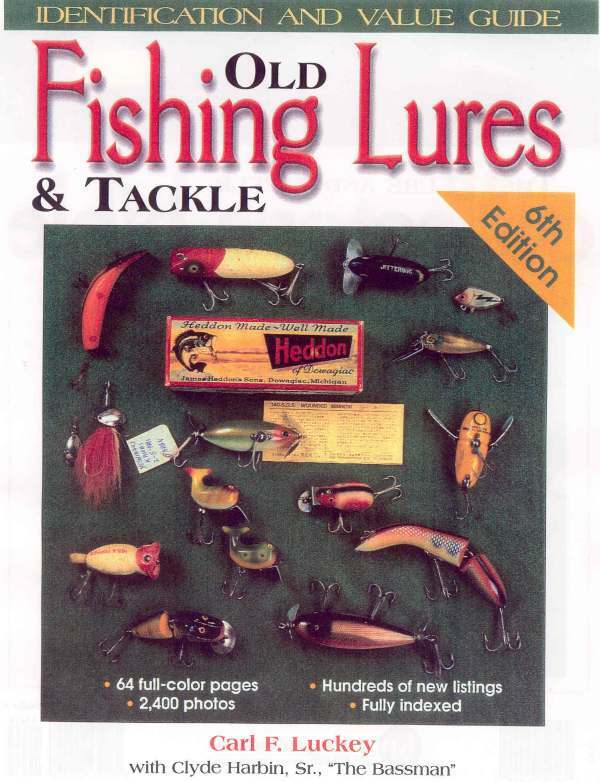 Mr. Harbin suggested that he purchase a copy of "Old Fishing Lures & Tackle" by Carl F. Luckey with Clyde Harbin, Sr., "The Bassman". 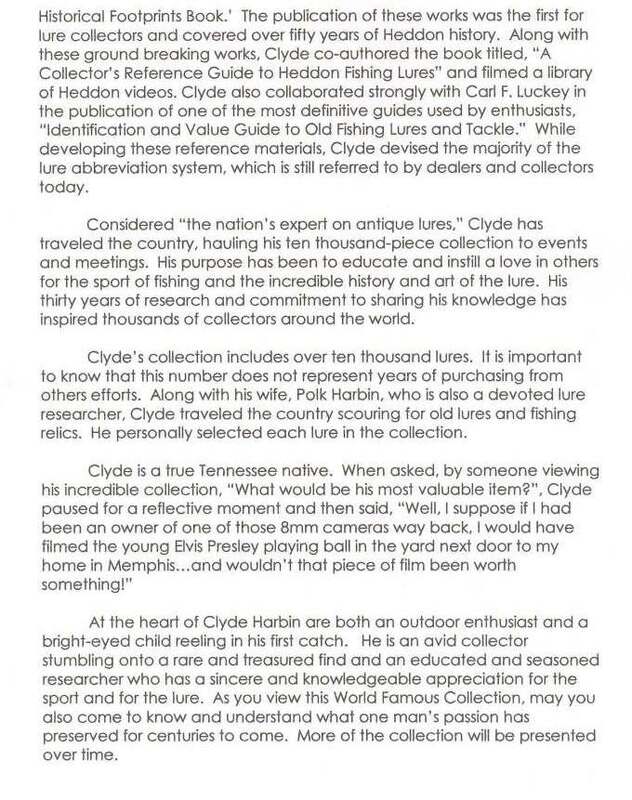 Below is the original Bass Pro Shops essay of the Clyde A. Harbin Sr. 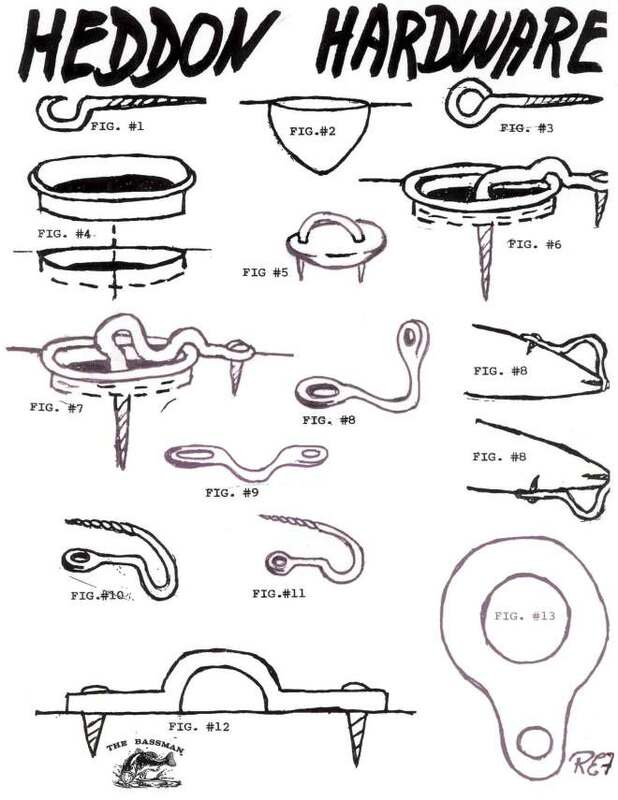 Lure Collection story. 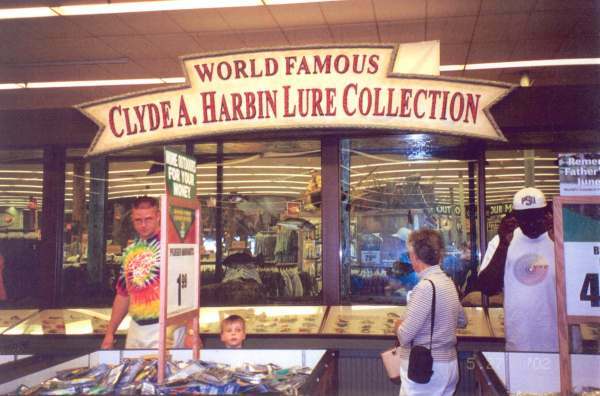 Bass Pro Shops featured this story at their exhibit of The Clyde A. Harbin Lure Collection at the Sportsman's Warehouse Store in Memphis. 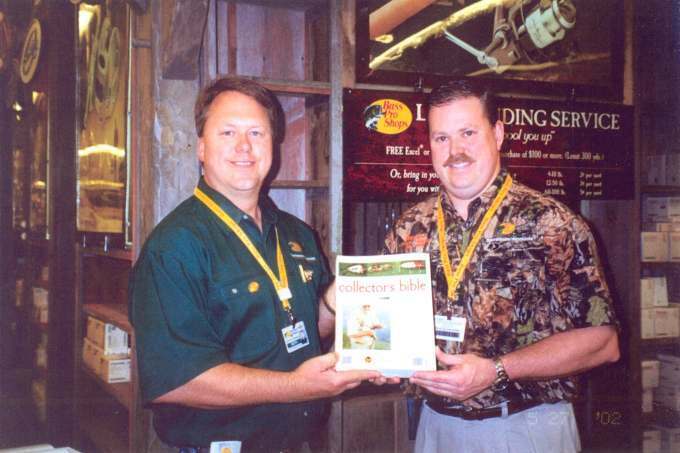 Mr. Rick Collins of Bass Pro Shops was so kind to furnish me with a copy of the story. 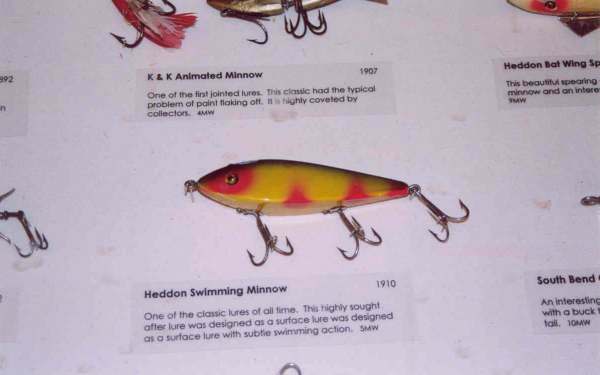 Mr. Robert Edward Ferguson provided the artwork of James Heddon's first lures for Mr. Harbin's "James Heddon Sons Catalogues" book. Mr. Ferguson and Mr. Harbin are good bass fishing friends and long term friend of over 42 years. 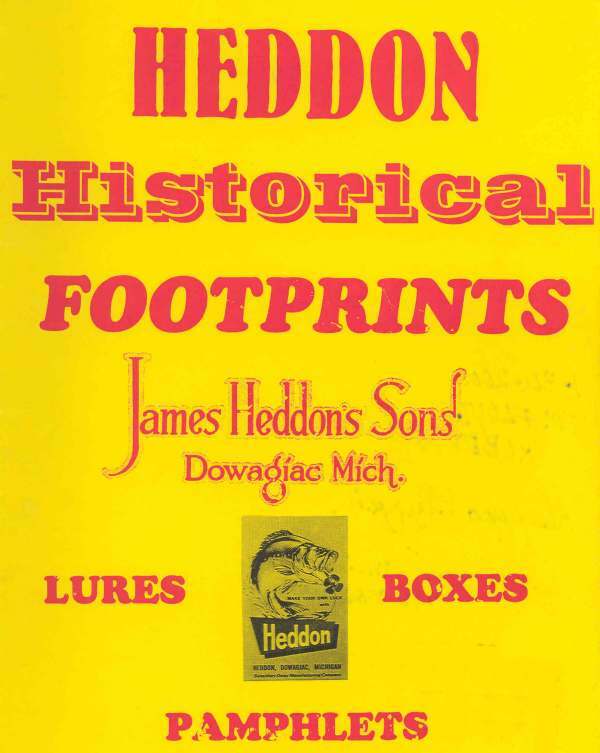 The below artwork was supplied for Mr. Harbin's "Heddon Historical Footprints" book by Mr. Robert Edward Ferguson. 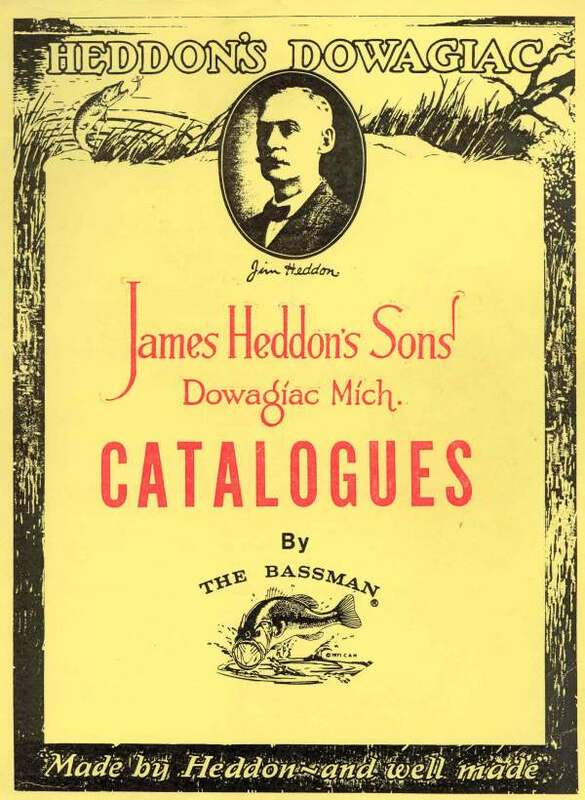 For information about publications of "James Heddon's Sons Catalogues", "Heddon Historical Footprint Books" and "Identification & Value Guide Old Fishing Lures & Tackle" books please write call or email>>> Krause Publication, Inc., 700 East State Street, Iola, WI 54990 or call 1-888-457-2873 or email Mr. Jim Felhofer (Sales Manager, Book Division) felhoferj@krause.com. 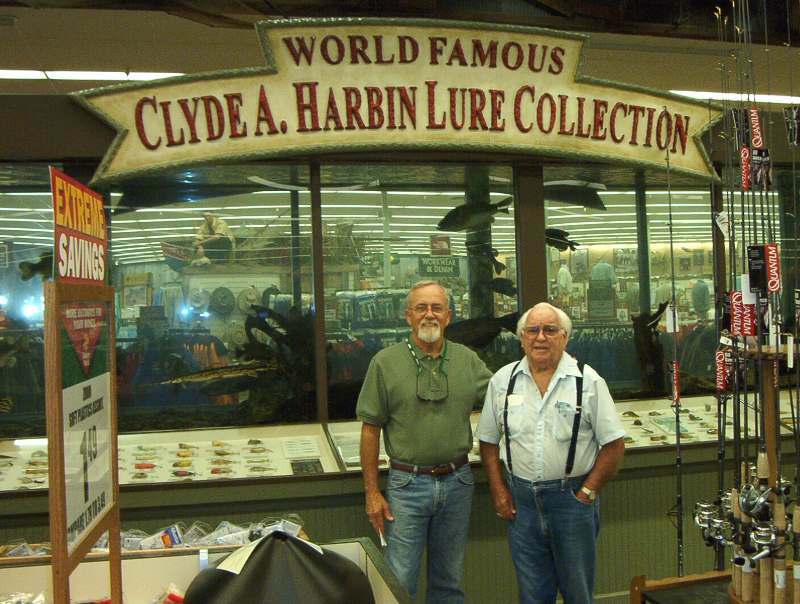 This is a recent photograph of Mr. Clyde A. Harbin Sr. (Father) & Mr. Clyde A. Harbin II (Son) enjoying time together at the "Sportsman's Warehouse" at Bass Pro Shops in Memphis on July 2, 2003.